Prime Minister David Cameron, with Conservative Prospective Parliamentary Candidate Anne Marie Trevelyan near the A1, north of Morpeth. Chancellor of the Exchequer George Osborne will today give the go-ahead for £290million of funding to complete the dualling of the A1 from Morpeth to Ellingham, “to make the Great North Road truly great again”. The 13-mile stretch linking the Morpeth and Alnwick bypasses and north of Alnwick to North Charlton will be upgraded to create a continuous dual carriageway from Newcastle to Ellingham. There will also be a number of enhancements to the A1 north of Ellingham, including passing lanes and better crossing facilities for pedestrians and cyclists. Although the A1 is the major road linking Newcastle to Edinburgh, it has suffered from under-investment for a number of years, according to Conservative Party officials. They say that massive delays and congestion result from only small sections of the road being dualled – this has particularly affected towns like Berwick and Alnwick, whose local economies have suffered from poor infrastructure. George Osborne said: “Today’s announcement that we are dualling the A1 between Morpeth and Ellingham is great news for Berwick [constituency] and a real victory for the brilliant Conservative candidate for Berwick, Anne-Marie Trevelyan, without whom this would not have happened. She set up the Dual the A1 campaign, brought a petition to Downing Street and made sure that everyone from the Prime Minister down was aware of the funding requirements for this road. “Anne-Marie took me to see the road earlier this year and to hear from local businesses affected by delays on the A1. The news was expected to be announced in the Chancellor’s Autumn Statement on Wednesday, but the announcement will be made today, two days ahead of his key financial speech. 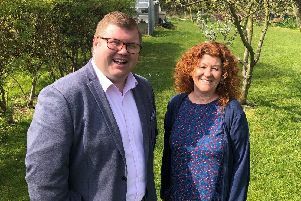 Anne-Marie Trevelyan, Conservative candidate for the Berwick-upon-Tweed constituency, said: “This is really, really exciting news for the whole region and for each family which has suffered a loss on the road. “The Dual the A1 campaign has worked tirelessly for the last seven years, pulling together a range of voices, including individuals, businesses, emergency services and logistic firms from across the country, and now we have managed to cross the starting line. However, the Liberal Democrats have a different take on who is responsible for the A1 dualling breakthrough. Sir Alan Beith, MP for the constituency, said: “Having campaigned for improvements to the A1 north of Morpeth for many years, I am delighted that the Liberal Democrat Chief Secretary to the Treasury, Danny Alexander, has made sure there is funding for these significant improvements – something the Conservatives promised in 1992 ahead of a General Election, but then failed to carry out. Julie Pörksen added: “It’s only been possible to get this investment in the A1 because we have Liberal Democrats making decisions as part of a Coalition Government. Mr Alexander said that the announcement was a landmark day in the history of the North East. He added: “Finally, the calls from Sir Alan Beith MP and Julie Pörksen have been answered. o A £2billion commitment to dual the entire A303 and A358 to the south west, including a tunnel at Stonehenge. o £300million to upgrade the east-west connection to Norfolk, by dualling single-carriage way sections of the A47, which are creating congestion and safety concerns on the road.